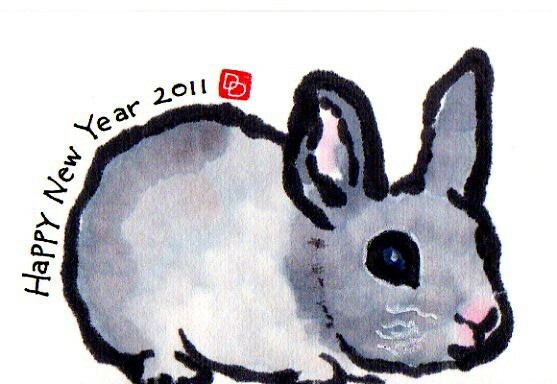 2011 will be the year of the rabbit. i lived in japan from 1989 until 1996 and the way that new year's is celebrated is something i really miss here in canada. it really is the equivalent to our hannukah or christmas or solstice (depending on what one celebrates). everyone sends out a ton of nengajo - new year's post cards - to friends and family. isn't this bunny post card cute? everyone cleans their house in order to not bring old dirt into the new year. and i mean clean - like wash the curtains clean. so there will be some cleaning and organizing between now and december 31st. and on the first day of 2011 maybe some eating of soba noodles and mochi and sushi. definitely some sake drinking and relaxing with family. 2010 was pretty good to my family and i have lots of plans for 2011. happy new year and all the best in 2011.